When the roads are going to be busy again, when it starts to get dark earlier, when you see new shows debut and your favourite series return on tv, when the air gets crisper, and, especially, when, at six in the morning, the alarm clock resumes its annoying trill to remember that it is time to go back to work, you realize that summer is ending. Wrapped in a cloud of subtle melancholy, you begin to see and see again the photos taken on the beach and remember the laughs and the fun of those days spent at sea. To cheer us up and try to let us rewind, a little more brightly, our memories, the master Enzo Coccia created a new recipe with an ingredient that marks the end of the warm season and leads us, with its sweet verve, into autumn. At first blush, it sounds quite out of tune. 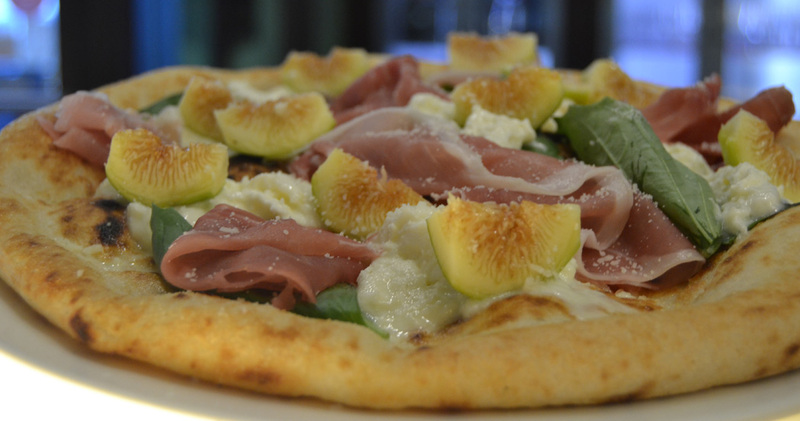 But, the combination pizza and figs, far from being unusual, comes from the rural world. A pairing given by the times when those fruits, which, in abundance, the nature provided spontaneously, mixed to the dough of flour and water, simple mixture and easy to find, were a happy rest from too strenuous exertions in the fields. Or, more simply, a poor meal. No matter if the Romans left traces of its low value with the expression “it’s not pizza and figs”, idioms aside, this union proves to be a genuine wealth, as wealthy and absolutely positive is the charge given by the Culaccia. That is the best part of the ham, the Parma’s specialty declares, without hesitation, as soon as it is tasted. Then, there is the stracciatella as a trait d’union, in the Neapolitan pizzaiolo’s latest creation, between the fruits from Caria and one of the finest cured meats. Born under the motto “do not throw anything away” and an unknown dairyman’s acute intuition to use what remains from the process of making mozzarella, the white delights from Puglia, a blend of sour cream and fresh rounded dairy strips, creamy soul of the well-known burrata, caressess with its lovely lightness and its delicate notes. A perfect ensemble for the pizza that says “goodbye” to the sun and the tan whose embracing flavor perfectly match a white wine with floral aromas, elegant and structured, a blonde or weiss beer which, fresh and aromatic, drunk cooler confirm the expectations, or, even, the most pandering bubbles for a decidedly appealing.